Clinton County, founded in 1830, was named for New York State's seventh governor, DeWitt Clinton. He was largely responsible for the construction of the Erie Canal. I'd like to know why the county was named after him, since no canals pass through it! 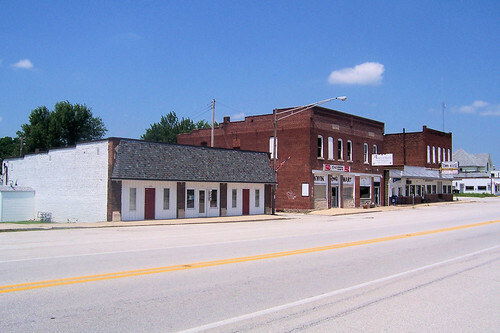 Shortly after entering Clinton County, the town of Kirklin appears. 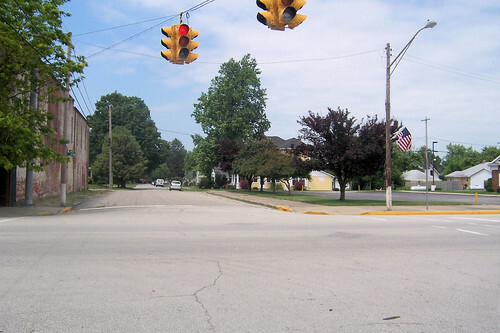 Laid out in 1837 by Nathan Kirk, it was once called Kirks X Roads or Kirk's Cross-roads, recognizing its founder and the two oldest major roads in Clinton County – the Michigan Road and the Newcastle-Lafayette State Road. The latter road stretched from New Castle to Lafayette, probably along the general path of State Road 38, which stretches between those towns today. The Newcastle-Lafayette State Road was built a few years before the Michigan Road. 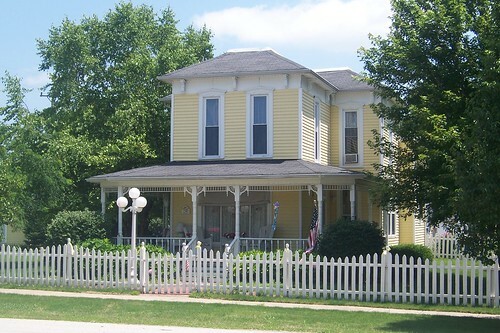 The town was incorporated in 1878. 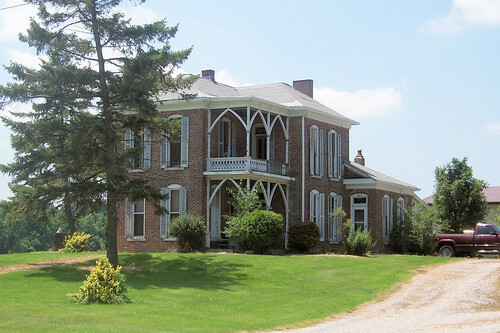 The first thing I notice every time I enter Kirklin from the south is this attractive and well-kept home. I understand it was once the residence of a prominent doctor. I came across a cache of 1920s postcard images of Kirklin. This card shows Kirklin's downtown in those days. It is astonishing how little the town has changed in 80+ years. A few buildings have been razed, but the overall shape of downtown is the same. This is the west side of the downtown strip. I believe the white building on the right is the one behind the "Garage" sign in the 1920s photo. Two buildings to the north of the garage were torn down, but the next three buildings match those in the 1920s photo very well. This is the east side of the downtown strip. I count five buildings here that are in the 1920s photo; the only one missing was where the vacant lot is. I'm told that the water tower is the former site of the Kirklin Methodist Church, torn down sometime in the 1970s despite efforts to save it. This building was never a Mobil station. Somebody painted it to look like one, perhaps to sucker in people like me. An earlier version of this paragraph wondered when this station was built. 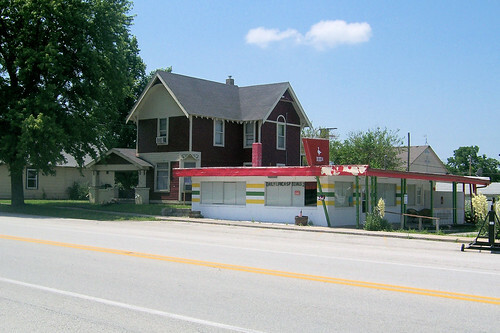 A former Kirklin resident wrote to correct me – this was never a gas station, but a barber shop. As you can see, I was out road tripping at the height of the 2008 gas price mess. 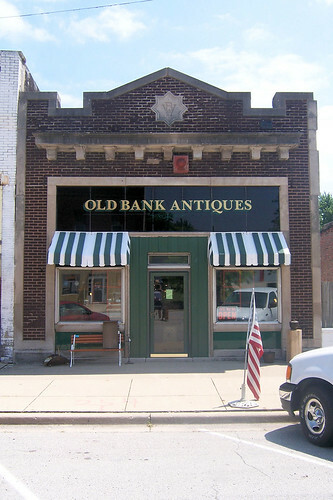 Much of Kirklin's downtown is given over to antiques stores. As I was out taking photos of the town, the antiques proprietors all gathered in front of this store to watch. When I came by, they were very curious, and maybe a bit suspicious, of what I was doing. They softened a bit when I explained about the Michigan Road. They lamented the lack of business on this Saturday, the day after Independence Day. They hoped Indianapolis's sprawl would extend farther into Boone County for the traffic it would bring. This photo shows the intersection with Madison St. in the 1920s. On the right is the Masonic Hall. The antiques proprietors told me that the Masonic Hall was torn down in the 1960s. It strikes me as odd that a side street warrants the only stoplight in Kirklin while State Road 38, one block north, gets a stop sign. Here's a better view of the Masonic Hall. Check out that lamp hanging out over the street. 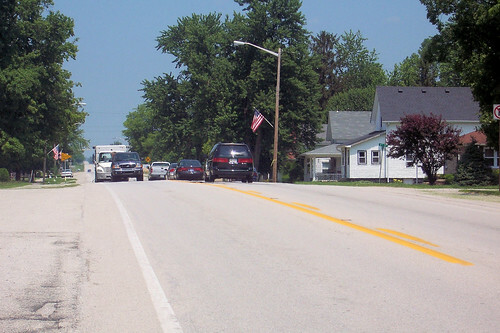 Here's a southbound view of Main St., as the Michigan Road is signed in Kirklin, from just north of the Masonic Hall. 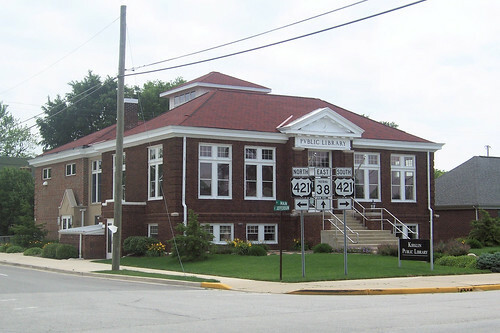 The Kirklin Public Library stands on the southwest corner of what is now State Road 38. The building has been remarkably well kept. It is the town's crown jewel. 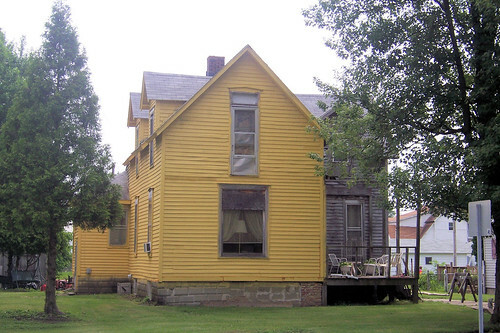 As I drove out of Kirklin, I couldn't resist photographing this old house, with its second-floor screen door. A bit north of Kirklin, the Michigan Road curves and becomes a straight north-south road for the first time. The map doesn't show it, but this is where US 421 leaves the Michigan Road, following State Road 28 to the west. 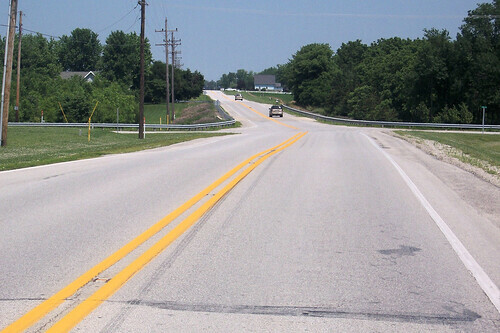 Here the Michigan Road becomes State Road 29 and carries that number to Logansport. 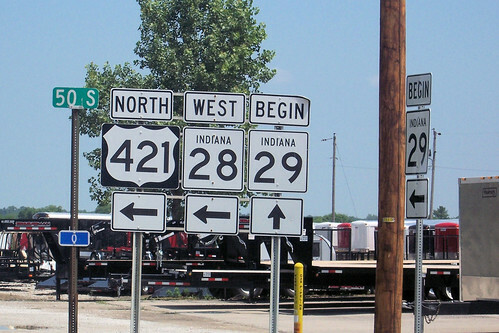 When Indiana implemented its current highway numbering scheme in 1927, the Michigan Road was numbered 29 from its starting point in Madison. 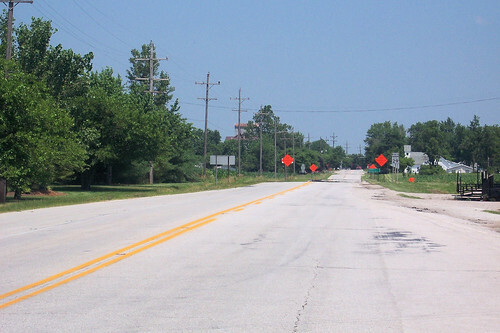 US 421 was extended into Indiana in 1951 over existing Indiana highways 28, 39, and 43 to its end at Michigan City. Northwest Indiana's Kankakee Marsh was drained beginning in late 1800s so the land could be farmed. This allowed later roads to be built through the former marshland, including these that now carry US 421. 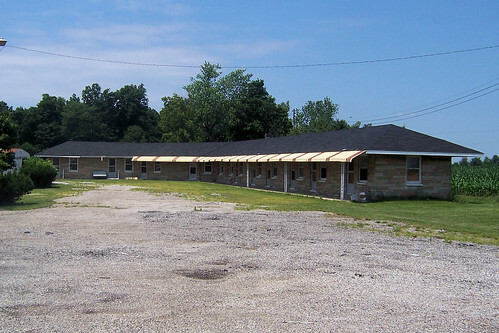 Where State Road 28 reaches US 421 from the east stands an abandoned motel. Here's the sign tree where US 421 leaves and State Road 29 begins. Here's the Michigan Road as it heads into Boyleston. 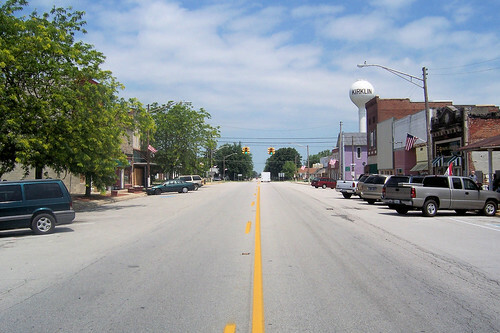 Boyleston is an unincorporated town founded in 1875 by Lewis Boyle as a stop along the Lake Erie and Western Railroad. 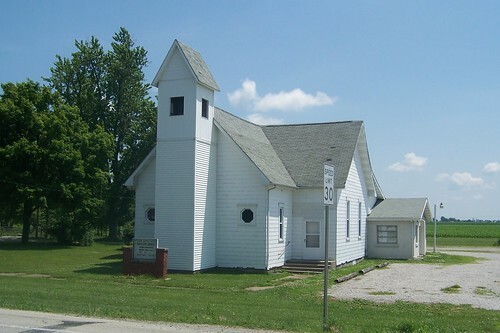 This is the Boyleston Baptist Church. This grain elevator was probably Boyleston's focal point. North of Boyleston stands the sprawling Clinton Central High School. I am surprised by how few schools, compared to churches and cemeteries, stand along the Michigan Road. 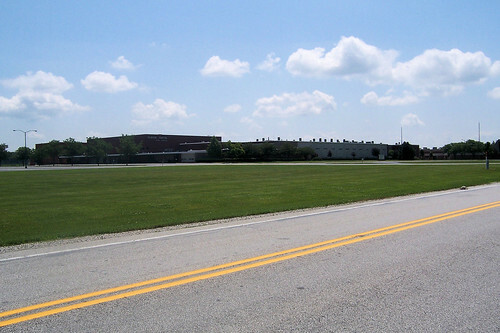 This is the first school on the road since the road passed through northwest Indianapolis. The road bent slightly northeast in Boyleston; it bends back straight north by the school. 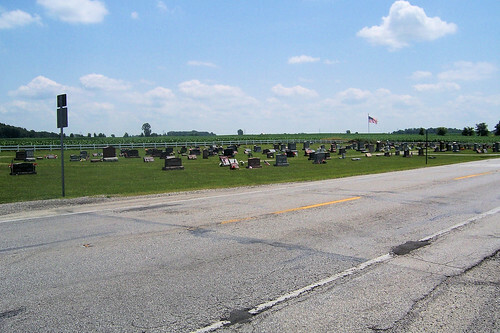 This cemetery lies just south of Michigantown. 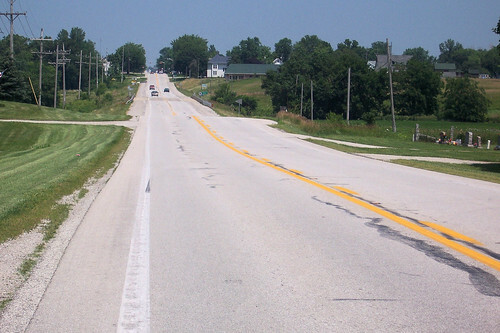 This is a typical scene along the road in this part of the state, as it tracks straight and flat between farms and small towns. Michigantown is ahead. 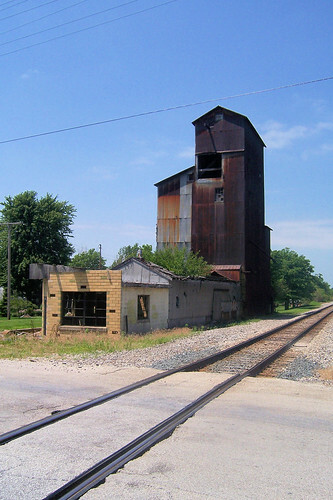 Michigantown was laid out in 1830 along what was then the Frankfort and Kokomo Railroad and was incorporated in the early 1870s. 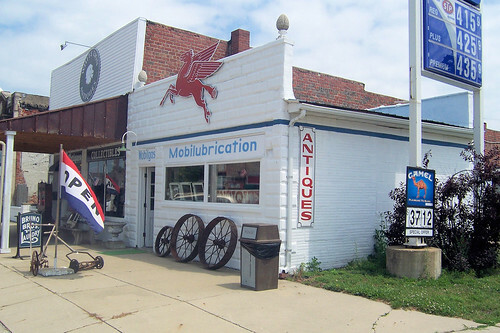 In the 1800s Michigantown was a happening place with merchants and doctors and lawyers, but today like so many other midwestern small towns it stands in some decay. This map shows Michigantown. 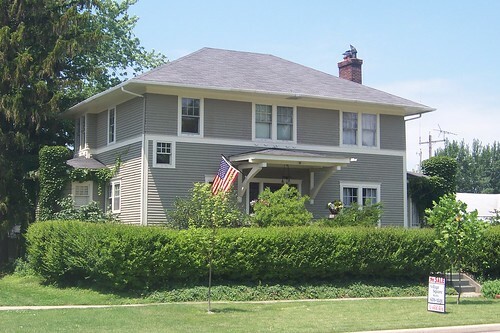 A number of older homes stand in Michigantown, this being a clean example. The diner next to the house looked to be on a permanent vacation. 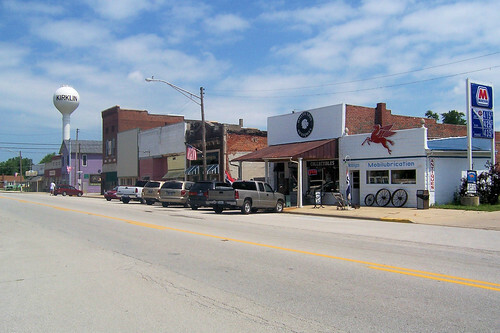 This is Michigantown's business district. Ron's Kwik Mark doesn't look very kwik anymore. The space on the right used to be the Farmers Bank. The only business I found open this day was the Michigan Town House. 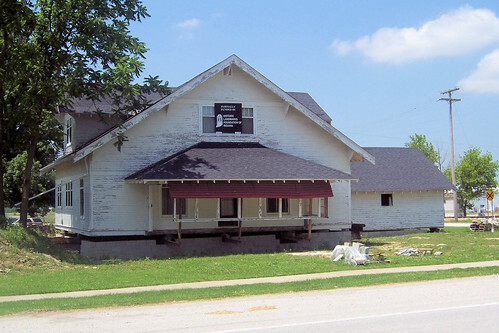 The storefront between it and the post office is known as the Mule Barn Tavern. 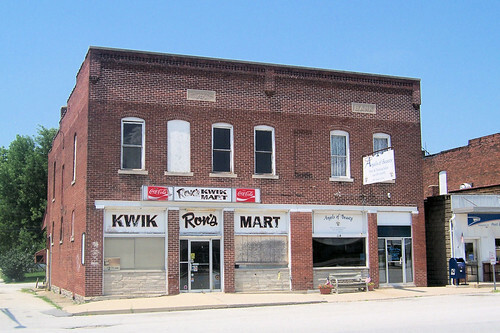 There are plenty of empty storefronts in Michigantown. 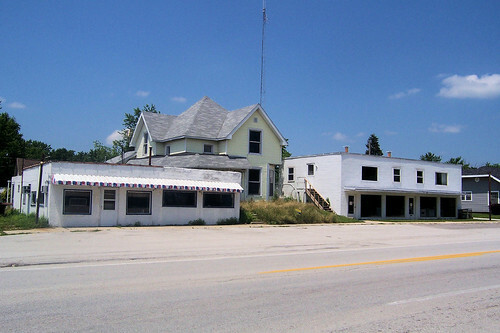 The building on the left used to be a small diner. 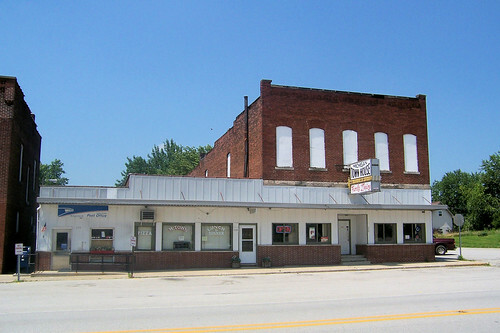 The building on the right was Newell Gas and Appliances. 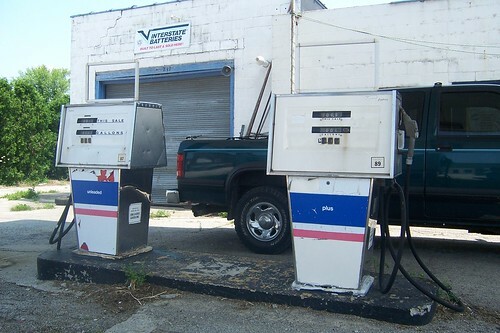 This gas station has been abandoned since gas cost $1.099 per gallon. 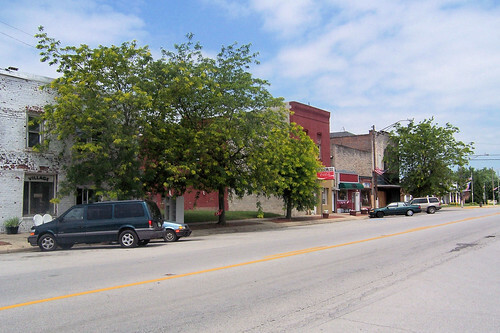 North of Michigantown's business district, the town becomes residential and overall well kept. 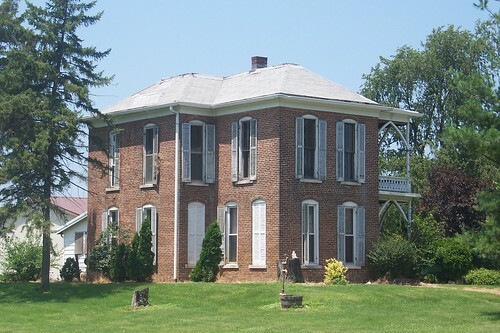 The Historic Landmarks Foundation of Indiana moved this house to this spot along the Michigan Road, just south of the railroad tracks on Michigantown's north end, in late 2007. Workers have been busy laying a new foundation beneath it since. Across the street stands this lovely old home. Even though I stop in every town for photos, most of the road in this part of the state passes by farm after farm, as this short video from north of Michigantown shows. 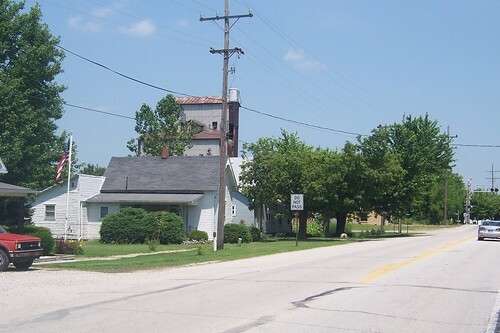 Near Clinton County's north border stands Middlefork, an unincorporated town named for its placement near the middle fork of Wildcat Creek. Middlefork barely registers on an aerial map. 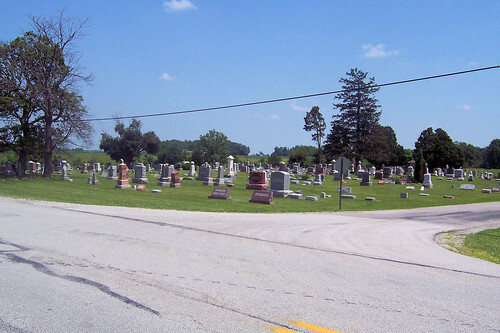 This cemetery lies just south of Middlefork. 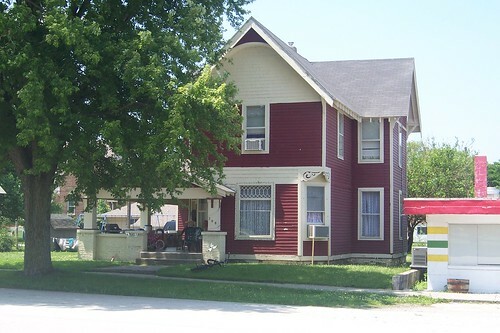 This old house is in Middlefork. It's one of my favorite houses along the route because of its interesting porches. This itty bitty house stands in contrast with the previous one. Middlefork ends at State Road 26, just beyond which begins Carroll County. 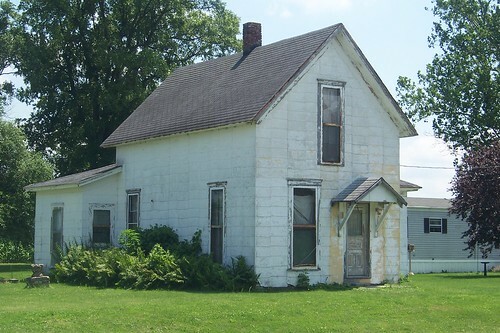 This school stands abandoned on an abandoned alignment of SR 26, which lies 50 feet south of current SR 26 just east of the Michigan Road. Created 1 January 2009. Updated 13 March 2009. Photos subject to the Creative Commons Attribution-Noncommercial-No Derivative Works 2.0 Generic license. Maps are screen shots from Google Maps unless otherwise specified. All copyrights acknowledged.